Two years ago I volunteered to teach a few evening classes at the library. 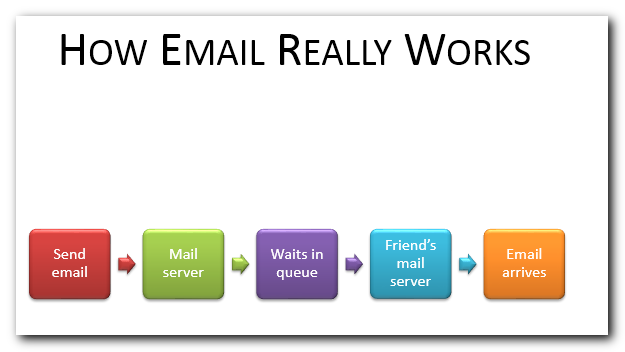 Using the slides from the “Basics of Email” class, I created this presentation for you. Enjoy! Today we’re going to discuss how to get more out of email. And there’s three main goals that I have. The first is to help with your online safety, avoiding things like viruses and phishing scams. To be more effective and make better use of email, and then to fix problems that might come up that you might experience. So let’s just give a little bit of a background on how email works. The first part is the client. That’s the part you use to read email. And you can see a breakdown here of the main categories of email clients. Out of the two main categories you have desktop and web. They are both good for different things. Web is nice because you can use it wherever, at your friends house or something. Desktop is sometimes nicer for larger emails or for doing a lot of images and attachments and what not. Let’s just discuss how email appears to work and then how it really works. So it seems like you just write an email, you send it and then the email arrives at your friend’s location, or in their email client. What actually happens is the email is sent and it goes up to your mail server and then it waits in the queue for a little bit and once it gets out of that queue it gets sent and in here actually it could even be more than just one mail server. It doesn’t go directly necessarily, but it could, to your friends’ or the recipients’ mail server if you’re writing to your enemies. And once the mail arrives at the mail server there’s still one more step. And that’s for the email client to pull down the email from the server. So just so you understand how it works, it’s a little more explicit when you’re using a desktop client but even a web client uses the same approach, it’s just a little bit behind the scenes because you’re just logging in to the website and it seems like it already has these emails there. It’s already been downloaded. And this is modeled after how regular, postal mail works. You have an address on a letter or a postcard, you put in the mail and send it. The post office takes care of the delivery, that’s kind of like the mail server and then it arrives at the destination in the mailbox. But then the user has to go out to the mailbox to actually get it. And that’s exactly how email works. The client has to retrieve it from the mailbox, in this case the server. So an email address is simply another address that you might have, so here’s an address of our dear friend Bob Cratchett. And the email address is similar, you have the username and then the at symbol, and what comes after. So that’s really all there is to an email. Sending an email is probably pretty obvious to you. You simply put in who you’re sending it to, put in a subject and a message. I’m going to flip this on it’s head for a second. I actually recommend doing it the opposite, doing it in exactly the reverse order. I suggest writing the message first, then putting in the subject. Because once you know what the message contains, you can write a much better subject. And only then do you enter in the email address, because it’s very easy to accidentally send an email before you’re done with it just by hitting Enter sometimes. If you happen to have the focus on the send button or if you do any number of other mistakes, that you don’t want to send it. If there’s no to address then your client’s going to complain it doesn’t know where to send it. So it’s a nice little stopgap to make sure you don’t send an email accidentally before it’s done and you get better subjects. There are a few more fields that we’re going to discuss briefly. The Cc is a recipient that you’re including in the email, and they can see that they’re being included. The Bcc is simply a blind recipient so the people in the To and the Cc fields don’t know about the person in the Bcc. It’s kind of a hidden addition. And you need to be careful with that because although the person who Bccs it, once they get it they can still reply to everyone else and all of the sudden people know, ah ha, they got the email. So be careful of that. There’s also the Date, Reply-To and then there’s also the signature which isn’t necessarily a field, but in a lot of mail clients you can set a signature which is just some text that goes at the bottom of an email. Now, replying can be confusing to some people. There are three main ways of replying. Reply is just going right back to the sender, so that’s the typical back and forth you might have with a regular letter. Reply all is everyone that’s visible to you, so everyone in the To and the Cc fields. That’s who’s going to get your response. And then lastly is forwarding, which includes the entire email, with the email addresses, to someone else. And you’ve probably gotten forwards in your email. Let’s go over privacy a little bit. Email is about as private as a postcard. So the contents can be seen along the way on the various mail servers and a system administrator on the mail server can simply open up the mail queue and read your email. So be careful of sending things that are very sensitive. Because unless they’re using SSL, certain mail servers are starting to use that, but it’s certainly not that pervasive across all mail servers, they may have access to your email. And you don’t want to be sending information that would be problematic if they read it. Now there are various kinds of problems that might happen. One of them is a bounce, and that’s simply when there’s no one at that email address. So the mail server says I don’t know where to deliver it, return to sender, just like you’d get in the post office if you’re trying to mail Santa Claus. Another one is the email attachment’s too big, that’s kind of like with regular email if you didn’t use enough postage, they send it back because you sent too much mail. The limitations depend on the mail client and the mail servers, so that differs depending on the service you’re using. Another issue is delayed delivery. That means the mail server tried to deliver it. It’s kind of like the UPS delivery guy who tries to deliver a package but you’re not there and he says, “I’m going to come back.” The mail server does the exact same thing, saying I’m going to come back and try to deliver this at a later point. And if it eventually fails it will let you know that it couldn’t deliver it. Now some terminology, let’s just go through this. Spam, is unsolicited bulk email, which means email you don’t want. You’ve probably all gotten spam and you know how that works. Flaming is an angry or antagonistic response. It’s often used more in forums, which are discussions online, but you can also get email flames where someone flames you or gets angry at you. Phishing is where they’re trying to trick you into thinking it’s a legitimate request. Sometimes they’ll say your account has been compromised, you need to change your password. And so they ask you to log in, but you’re not actually going to the site. The link they gave you in the email is some other random site they set up that’s made to look like your bank and then you log in and they all of the sudden have your credentials. Spoofing is another one where they’re using fake email headers. They’re making it look like it’s sent from a different source than it actually is. And that’s often used in combination with phishing, to make it seem more legitimate. And the last is bombing which is just sending a whole bunch of email to someone. In fact spamming is kind of a mild form of bombing. But email bombing is sending thousands of emails at a time. So hopefully you don’t have to deal with many of these. A few scams to be aware of, just for your own safety are the Nigerian prince scam where he says I have a bunch of money to move. That’s obviously not the case. Another one is you won a lottery. It’s kind of hard to win a lottery if you didn’t enter it. So the scam there is they say you just have to pay the armored car fees and we’ll get you all these millions of dollars. That’s kind of silly because you’re not going to get cold hard cash. Another one is lost in London. It doesn’t necessarily mean London, but that’s the common area. You get an email from your friend saying you need to wire money to London because I’m lost here and I lost my wallet and I got pick-pocketed or something else. That’s a scam where someone’s taken over your friend’s email address and now they’re trying to capitalize on that. And the last one is forwarding for money where they’ll say, “If you forward this email, Bill Gates will pay you $1,000.” Well, Bill Gates, albeit rich, is not silly enough to send email that asks people to forward other email, cause that’s very easy for someone else to do as well. Okay, let’s go on to folders. This is basically a way to organize your email, just like you would in a file cabinet. The typical folders you’ll have are Inbox, Drafts, which are unfinished and unsent emails. Sent is a history of what you’ve sent to other people. Then you’ve got the trash where you put deleted emails. And it is nice to have the trash because sometimes you’ll accidentally delete an email and you can go to the trash and retrieve it. Often, especially on web email, that trash is deleted, so be careful about waiting too long to go retrieve something because it might be gone when you try to get it. And the last one is custom, which is basically how you want to organize your email. You can have any number of folders just to keep it more organized. Filters are a way to make it easier to manage your email. So there are some filters that are set up for you, like spam and junk mail. And they check for patterns and known words to filter on. It’s an active area of research, sometimes it works better than others. I’ve noticed that recently Gmail has been starting to send a lot of email that’s legitimate to my spam folder. So it’s a good idea to check on the spam folder every once in awhile. Viruses or attachments that have a virus. That is pretty good now, though there are ways to get around it that people are still trying. And as I mentioned earlier, phishing. There are some known attacks that are often filtered out by your mail client. But that’s not always the case. Removing images is a way to limit the risk. It’s often used to track email opens. So if they see that the image has been loaded date check where it’s from and they can tell but you already email. A lot of mail clients will give you the option to not load the image. And that means they don’t know if you’ve gotten it or not. So it’s kind of a privacy area. And then there’s custom filters which is a whole other section that we could talk about that is simply a way to organize your email. So you could say all emails from my contacts go into this one or all emails on this mailing list going to this folder. And you can organize it to make it easier to manage. The next step of managing your email well is managing your contacts. They are closely related, and a lot of times they’ll have an auto fill as you’re typing in so that the client can match an address that you’re already using. You don’t have to type in their address every time so the address book is just like a physical address book that you have. You look up the person’s user name, their name and address and phone number and whatever else. A lot of contact management email is focused on email in the client. So you may not have things like phone numbers and everything else. But certain services like Gmail will have more information about a person based on their Google+ account. And there is development on that so you can get more information about the person. Searching email is useful to find things quickly. Instead of having to browse through or remember when did that person send it or anything else. You can do a few different ways of searching. Most clients will let you search for old emails and it’s useful to know specifically how your mail client works, but just to give you an idea of common ways of searching. You can just do free form text meaning you just put in a few keywords that you remember them mentioning in the email. If they wrote about last weekend’s get together you can use those keywords. You can search by subject and that just limits it down to the subject included something, then you can search for that. You can search by a from address or a date range and you can also search for an attachment. Even just if there was an attachment. If you know someone sent you an email that had an attachment you can exclude all the other ones and just go for the ones with attachments. And speaking of attachments, this is a an example of one case to do attachments, they often use the icon of a paper clip because you’re kind of using a paperclip to add on some file to your outgoing email. And they’re basically just files that are included with the message. Now, a word of warning, be careful to never open an unexpected attachment. If you don’t know what’s there, you might get infected with some sort of virus. It’s best to not ever open an attachment that you didn’t expect to come. Of course if they’re a friend and you know that they’re sending you something and you expect it then that’s fine. But still be careful of attachments just in general, its often a way that things can get spread that are nasty. The etiquette for email is, make sure people that you’re forwarding emails to actually want to receive those emails. A lot of times people have already seen what you’re forwarding and they don’t really want to hear more about it. So just be aware of that. Using all caps anywhere online is equivalent to shouting. So avoid using all caps except for strong emphasis in your emails. With Reply all, just be aware that it can reveal that you were in the Bcc like I mentioned earlier. So be careful about that. And lastly, make sure you use a good subject. Make it explain something. Instead of saying something like here’s some stuff, that’s not very helpful. You could say here’s a status update on this widget. So it gives you more of an idea. The person receiving it knows what it’s about. Email lists can be a great way to get a lot of information and to share things. There are two basic options for a list. You can subscribe to it and then you’re added to the list. There are two different kinds of options there is an opt-in that means you request to be added to the list and then a double opt-in, simply means that you request to be added to the list and then you confirm that request to be added to the list. So there’s those two, and then unsubscribing, now CAN-SPAM, the act that has tried to reduce spam, has had some limited effectiveness. It’s a start. The idea is that you need to have an unsubscribe link at the bottom of every email. If you have a list, you need to make sure that you provide a way for your users town subscribe. So make sure that you can unsubscribe easily from any emails you don’t want. If you’re sending out email lists. If you’re on email list, just look down at the bottom usually down near the footer and look for unsubscribe or remove me from this list, or something, and there should be a link. It’s important to know that sometimes spammers use this to their advantage, and use the link is a way to show that there’s a live person on the other end, and you get even more spam. CAN-SPAM has reduced that somewhat, but it’s still something to be aware of. Also know that auto responders, when you go to subscribe to a list, an autoresponder is something that will automatically send a reply back to you. And sometimes customer service departments will welcome you to the list and it sounds like there’s a real person there and you think, “Wow, this is great!” Just be aware of that they may just be using an autoresponder, there’s not someone sitting there the desk at three in the morning sending you emails. A few exercises you might want to do to familiarize yourself with email is to add an attachment. Or use the wrong address and see what happens when you send that. You can always experiment by sending emails to yourself to see what happens. Try using a Bcc, try sending yourself an email, putting an email address in the Bcc. Just to look at it. If you’re really anxious to see more of how it works you can look at the email headers. That’s how email clients know where to send it and all this various other information. And then take a look at some spam and see what they’re doing, especially phishing. You can take a phishing test and that can show you a little bit more about how emails work. And that’s it for the summary of how email works. Hopefully that’s been useful. You can learn more at TechMadePlain.com and you can get all the links there as well. My takeaway from transcribing this is that I say, “so” and “now” way too frequently. I also use run-on sentences when speaking.